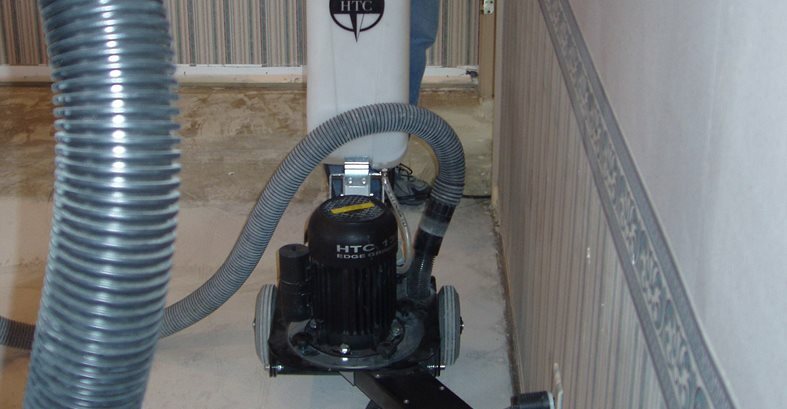 Tips for choosing the best equipment for edge polishing of concrete floors By Bob Harris, Decorative Concrete Institute, Temple, Ga.
HTC’s new edge grinder works right up against wall edges. Newer edge grinding equipment is lower profile, allowing the technician to get under racks and displays. Hand grinding is still necessary in some situations. Because of the contour of the sheet metal on these walls, this is a scenario where the only option is to hand tool the edges. 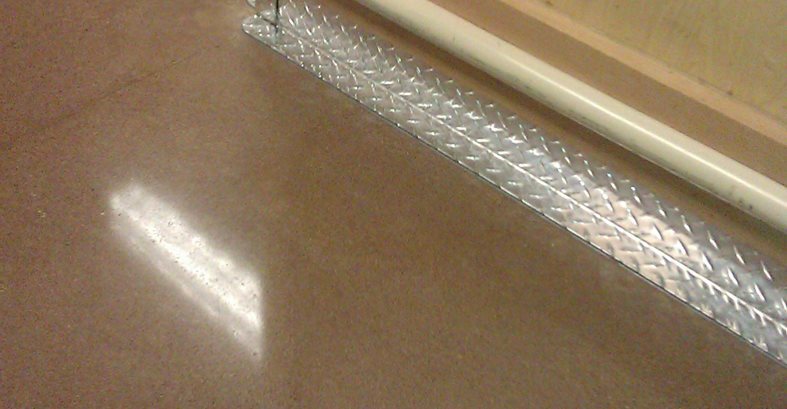 One of Verlennich’s resolutions for addressing floor edges that are in bad shape is to cover them with diamond plating. In the forever evolving industry of polished concrete, many advances in technology have been made with the roll out of new products and application sequences. Some of the most notable changes have been to the equipment, especially edge grinders. On a polished concrete project, dealing with edges is one of the least desirable aspects of the process. However, there is nothing more beautiful than to see a highly polished concrete floor terminate seamlessly at a wall. During the construction of our own shop and showroom, we ground and honed the floors up to 400 grit prior to erecting any of the interior walls, which greatly reduced the amount of edge work. Unfortunately, this is not an option on most projects because the building is preexisting, forcing you to work magic on the edges. Sometimes I use decorative solutions to enhance edges and eliminate the need for polishing. But if that’s not an option, what are the most important factors to consider when polishing edges and what equipment will you need? To get answers, I asked two leading industry professionals -- one representing the equipment side of the business and the other the contracting side -- a few questions on polished edges to get their perspectives. First, I talked with Clif Rawlings, the product manager and training coordinator of HTC America. I’m told that their new edge grinder won first place at the recent polished concrete rodeo held in Las Vegas at the 2012 World of Concrete. Next, I consulted with Dave Verlennich, a seasoned polished concrete veteran currently employed by Concrete Treatments Inc. in Minnesota. Harris: Looking back to when polished concrete first started, how have standup edge machines evolved over the years? Rawlings: There are quite a few changes from the old standup edgers compared to the new redesigned versions. First off, older edgers had very little flexibility in the grinding head itself. Now, not only are the grinding heads more flexible, but even the plate the tools are attached to gives a little as well, so each diamond tool flexes independently from the rest. This allows the tools to get in the high and low spots much better than before. The new edgers also have much more adjustability in the way of tilt or slope. Since exterior wall edges may slope down or up, it’s crucial to have the ability to adjust the grinding head to accommodate that. The equipment has variable-speed adjustment for when you are grinding with low-grit metal bond diamonds vs. high-grit resin bond tools. The newer equipment also has the ability to fit under racks, coolers, shelves, even toe kick plates. Power is obviously crucial if you are grinding down to expose large aggregates or removing a thick-mil coating. We now see some equipment offered in 460-volt three-phase power to give the operator plenty of torque for those situations. If a large contractor already has 460-volt three-phase power on the job to run their large planetary grinder/polishers, why not use the same power to run the edgers? It makes sense and it’s convenient. For the smaller contractor that needs to run off of 110-volt power, there are voltage mergers that will allow the user to plug into two separate-breaker 110-volt outlets and get 220-volt single-phase power to run a 220-volt single-phase machine. That makes it very versatile for the small contractor because they can run their edger off 220-volt single-phase power when available or off two 110-volt outlets. Harris: Talk about the pros and cons of using hand grinders vs. standup edge grinders from the contractor’s perspective. Rawlings: Standup edgers allow the user to be upright so there is less fatigue and fewer back and knee injuries. Also, they are more productive compared to hand grinders when working in big, open areas or along straight walls or aisles. Hand grinders can sometimes get in the really tight, low spots better, and the operator really can see their scratch pattern better. And in tight or really broken up areas or edges, the hand grinder will be faster. Harris: With the newer generation of edge grinders, does head pressure (down pressure) play into the quality of polished edges as with larger grinding equipment? Rawlings: In some cases, yes. For example our HTC 270 EG has 90 pounds of down pressure without the weight kit on it. That is the equivalent to one of the three heads on our HTC 500 grinder. So it’s capable of grinding just as fast and polishing to the same level of shine as the larger polishing machines. We have an additional weight kit you can add to duplicate larger machines, like the HTC 800 grinder. Harris: Is the diamond tooling different on edge grinders compared to walk-behind polishing equipment? Rawlings: It’s important to use the same type of tooling on the edges that you use out in the main field of the floor. If you do not, you are at risk of getting less depth and clarity on the edges, and in most cases, a lighter or even darker look on the edges compared to the rest of the floor. The HTC 270 EG has easy-change pucks on the bottom of the grinding head so you literally are using the exact same tooling from field to edge. Harris: With the recent advances in equipment, if contractors invest in standup edge grinder, does this mean they can expect to not have to do any hand work, or is there still a percentage of hand tooling required? Rawlings: They will still have to hand grind, but depending on the type of work a contractor does, from residential to big-box retail or even industrial floors, it can drastically reduce the amount of hand grinding a person may need to do on a jobsite. For smaller, more detailed jobs, like a residential floor, you can still expect to do about 40% to 50% hand grinding, especially if it’s not new construction and objects are in the way, making the standup edger cumbersome to operate in tight areas. On larger jobs, like retail or industrial floors, it could be as little as 10% to 20% hand grinding because you have the room to run the edger. Harris: How do contractors address corners? Rawlings: Most still use the 2-inch triangle diamond pads under an oscillating corner sander. The corners never really have the same gloss compared to the edges, and they typically are a little lighter in color, but it’s better than doing nothing at all. Dave Verlennich, Concrete Treatments Inc.
Harris: What percentage of your projects require complete polishing of edges right up to the wall? Verlennich: As much as 99%. Sometimes we offer the option of edging or no edging, but in the end, it seems to bite you. The customer does not fully understand the polishing process. You can explain and educate all you want, but some clients will not be able to visualize the end result. Most people are very visual. If you have the opportunity to do a full-scale mock up, this will seal the deal with a yes or no as the client will have the visual opportunity to decide, but this is not always possible. Harris: How much additional time and labor do you factor into projects requiring edge polishing? Verlennich: From 10% to 50%. In a wide-open area with four walls, maybe 10%. In an area that has several rooms and stem walls, it can be as much as 50% if the configuration is preexisting. 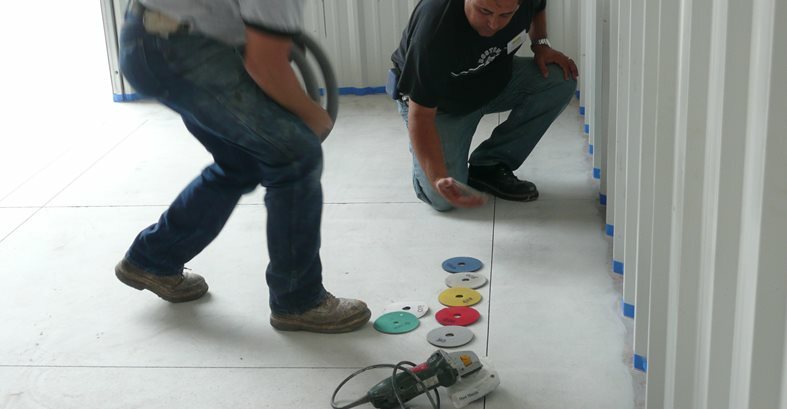 If you have the opportunity to be a part of the process before rooms or walls are laid out on the floor, your customer can save a lot of money polishing the wide-open space and installing the walls after. In lieu of grinding the edges, Harris sometimes enhances them with a decorative treatment. On this polished residential floor, the client wanted to get creative on the edges and around the columns. Because the house was near the beach, Harris used that theme, harvesting sand from the beach and broadcasting it into wet epoxy. Harris: When you quote customers your standard polished concrete price, does this include addressing the edges or is this priced as a separate line item? Verlennich: It’s kind of a contradiction to the above, but we do it both ways. We include edging in the package price when the spec calls for it or if you know it needs to be done. We just have to determine the amount of labor and then back up from there to stay competitive. I think if you charge what edging actually cost you, your overall bid will not be competitive. Harris: What type of equipment are you currently using for edges? Verlennich: The HTC 130 and HTC 270 EG edge grinders and 4-inch hand grinders. Harris: What are some alternative edge treatments you have used successfully in the past? Verlennich: On one project, for example, the edge looked bad due to poor concrete finishing. The edges rolled off and had terrible chatter marks. The only option was to grind deeper or cover some of it up. In this case, we covered it up with a diamond plate material, which provided an attractive look (see photo). If you are new to the business and have never addressed edges, do your homework relative to the types of projects you are targeting before you make costly investments in equipment. If your business consists primarily of tenant improvement, light commercial or residential, you may be able to save a lot of money initially by addressing the edges by hand, and as your company grows into doing larger projects, then consider acquiring standup edge grinders.